Don’t miss the charming sequel—THE ROSIE EFFECT! 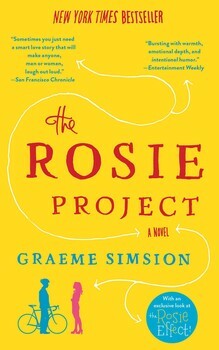 IN THE ROSIE PROJECT, Don Tillman, professor of genetics, has never been on a second date. He is a man who can count all his friends on the fingers of one hand. Conceding to the statistical probability that there is a significant someone for everyone, he embarks upon The Wife Project. Rosie Jarman possesses all these qualities. Don easily disqualifies her as a candidate for The Wife Project (even if she is ”quite intelligent for a barmaid“). But Don is intrigued by Rosie’s own quest to identify her biological father. When an unlikely relationship develops as they collaborate on The Father Project, Don is forced to confront the spontaneous whirlwind that is Rosie—and the realization that, despite your best scientific efforts, you don’t find love, it finds you. DON TILLMAN AND ROSIE JARMAN ARE BACK IN THE ROSIE EFFECT! The Wife Project is complete, and Don and Rosie are happily married and living in New York. But they’re about to face a new challenge because—surprise!—Rosie is pregnant. The Wife Project is complete, and Don and Rosie are happily married and living in New York. But they’re about to face a new challenge because—surprise!—Rosie is pregnant. Don sets about learning the protocols of becoming a father, but is hard-pressed to find time for pregnancy research. Between helping his best friends Gene and Claudia to reconcile, servicing the industrial refrigeration unit that occupies half his apartment, helping Dave the Baseball Fan save his business, and staying on the right side of Lydia the social worker, he almost misses the biggest problem of all: he might lose Rosie when she needs him the most.